White Sugar, Brown Sugar: INTERVIEW AND GIVEAWAY! Monica creates coloring books, too! 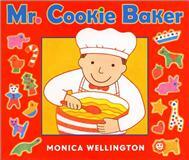 I had the pleasure of interviewing Monica Wellington, the author of my daughter's favorite book, Mr. Cookie Baker. The best part of Monica's books for our family is the beautiful illustrations which feature children of various races---not just a bunch of white kids! Besides the diversity, what I love about Monica's books include: the vivid colors, the recipes, the simple sentences, the details in the pictures, the simple but exciting plots, and so much more! I also learned so much about Monica---she's a single mom, she's a cook and baker (yum yum! ), and she's even more talented than I first understood. At the end of the interview is information on how to win a copy of one of Monica's books! Just in time for Christmas shopping!!! I am so happy that you found my books and enjoy them together with your family, and that you have invited me to participate on your blog. I have been writing and illustrating picture books for young children for almost 25 years. Many things have changed over that time including the ways I can connect directly with readers through email, websites and blogs. Since writing and illustrating is very solitary work, it is wonderful to connect to the outside world beyond my studio with families, teachers, and librarians. I love creating books. I love working on my own and being self-employed, never working in an office. The way of life very much suits me. I live in New York City. My studio space is in my apartment where I live. When I step outside, I am in the center of a very busy area of the city, but when I am inside my apartment, it is very quiet. I face into the center of a tree-filled block and the sounds of the birds create a buffer from the sounds of traffic. I can almost pretend I am living in the country! I have lived in NYC for 30 years. I have a daughter. (She is now 20 and dances with New York City Ballet.) I have been a single mother since she was born. Especially when she was young I felt very lucky to be self-employed, and to be able to combine work and motherhood so easily. I was working on my books very much in the midst of all the busy activities of her young childhood. I would draw and paint when she was sleeping (during naps, and early, early in the morning before she woke up), when she was on play dates, and then when she was at school. The book I want to highlight here, Mr Cookie Baker, was a book I wrote and illustrated when my daughter was about three. I have always loved baking and making cookies. I loved making cookies when I was little with my mother. The idea for this book came from those memories, as well as the experience of then baking with my daughter. In addition, some years before, I had worked in a bakery in NYC during the holidays. All this came together to shape the book. Mr Cookie Baker is about a busy day in the life of a baker, He makes cookies, step by step... He sells them in his shop to the neighborhood children...He finally eats a cookie himself before he goes to bed. There are just a few short sentences on each page. I didn’t say in the words where the story takes place, but in the pictures I show that it is a place like NYC, where there is great diversity: people of all skin colors and backgrounds. Mr Cookie Baker was my first book in which I included recipes. The recipe for the decorated sugar cookies is based on my mother's recipe - I fiddled with it to make it as easy as possible. Many people have told me how much they love this recipe and that the cookies always turns out! Apple Farmer Annie, Pizza at Sally's, Crepes by Suzette all include my recipes. More recently I have worked on a series of coloring books for Dover Publications that are about cooking and include even more of my recipes. Cooking is a really fun family activity, plus children learn so many valuable skills. And of course cooking is an important part of healthy eating. One of my coloring books "Color and Cook Healthy Snacks" just won a Blueberry Award honorable mention. In my small way I am happy if I can help encourage reading, cooking, healthy life styles, appreciation of the arts... and in my next book, an awareness of the environment. My new book is titled Gabby and Grandma Go Green and will be out in early 2011. It is about a little girl and her grandma (modeled on my own grandmother) working on a sewing project together. They make tote bags and then have a fun-filled day that’s great for the environment! To win a copy of one of Monica's books, please leave a comment on this post telling me which of Monica's books you think your kiddo(s) would most enjoy (visit her website to explore your options) and why. I'll draw a winner and post his/her name on my blog a week from today, Friday, November 19th. The winner will then have three days to contact me (supagurlrae at hotmail dot com) with her first and last name and address. If the winner doesn't respond within three days, I'll draw a new winner. I love Monica Wellington's books. My favorite is ZINNIA'S FLOWER GARDEN. I also like to use MR. COOKIE BAKER in the daycare center where I work. I love Crepes by Suzette, and it was always popular with kids I was babysitting. No matter how many times I read it to them, they never tired of the "game" of finding the photo of Monica's daughter, Lydia, on each page, always incorporated into a bustling, colorful Parisian scene. This book is especially beautiful for its combination of illustrations and photos of Paris. I'm not familiar with this author, but the books look great...I'll have to check them out at the library! The one I am most interested in reading is Mr. Cookie Baker- I LOVE to bake, and L. is just starting to get involved more...what a great way to encourage him! Our baby is not home yet-but I think What is Your Language would be a great book for when our little one is home from Colombia!! Awesome! I love hearing about new authors we'd like to check out. Mr. Cookie Baker looks neat - and who doesn't love a good recipe for cookies?! Abby's getting into cooking (well, mixing, anyway!) so she'd probably like that - or the Who Says That book - because she LOVES animals and trying out animal sounds! ALL of these books look great! I am most intrigued by "Night City." I love Monica's books! She was my teacher (I'm an author/illustrator too!) a few years ago when I was developing a book about biracial children– a story about an older sibling imagining what his baby brother or sister will look like, entitled, I'm Your Peanut Butter Big Brother. Monica thought I should let you know about it/my work. My blog is: selinaalko.blogspot.com. And website is: www.selinaalko.com. I haven't seen these books before. I am excited to read them to the girls. We don't have a favorite yet since we haven't read any of them yet, but they all look very interesting. I think the first one I want to read is Mr. Cookie Baker. Thanks for sharing! I've never seen this, but am interested in Healthy Snacks!! Fun! My son would love Truck Driver Tom or Pizza with Sally... because he loves anything that has to do with trucks. He is also developing a love of pizza! The healthy snack looks great...always needing new ideas!